"The same gourmet cookies and brownies you enjoy at the shopping mall are available in fantastic gifts and gift baskets to share with your family, friends, and business associates! We offer a wide range of exclusively designed gifts and gift baskets, perfect for any occasion, including birthdays, anniversaries, Valentine's Day, Mother's Day, Father's Day, Christmas and Hanukkah; as well as any sentiment you wish to express—Thank You, Get Well, Best Wishes, and Thinking of You. Each cookie is baked fresh and each gift basket is packaged with personal attention to detail, right down to each hand-tied bow. In fact, we guarantee the quality, freshness, and presentation of our gifts. If you're not 100% satisfied, we'll do what it takes to make it right." NEW! Choose from a sampler of 60 or 112 Nibblers® bite-sized cookies, or 12 or 24 original cookies. What we thought: We love Mrs. Field's cookies! What always amazes me about these cookies (next to how delicious they are:) is how they ALWAYS taste so fresh...as if they were just pulled from the oven! The Loveable Valentine's Tin we reviewed was no different. These little cookies we so soft and chewy...in my opinion, the perfect cookie consistency! 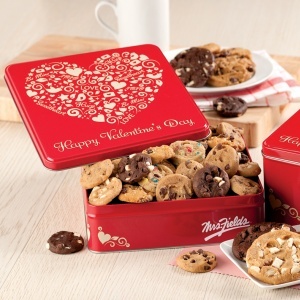 The great thing about the Loveable Valentine's Tin is the variety of cookies you get to enjoy. Ours was full of Nibblers, cute little 2-3 bite cookies in a variety of flavors including oatmeal raisin, snickerdoodle, white chocolate macadamia, chocolate white chocolate chip and of course, the original chocolate chip cookie:) We devoured nearly the entire tin in one weekend...YUMMO! The Loveable Valentine's Tin would make a really great gift for that special someone or could be fun to take to the office or classroom party. ABCD Diaries gives Mrs. Field's an A+! Find a great variety of Valentine's Day gifts at Mrs. Field's! Disclosure: ABCD Diaries was given product for review purposes only. We were in no other way compensated. The opinions expressed in this post are ours and ours alone. I entered your GoMaxGo candy bar giveaway! Amazing valentines day gifts, valentines gifts for girl friends, olive-wood products gifts, porcelain figurines, handicrafts and paintings collection of Indian tradition, nice to see all at one place in http://www.maayin.com. I entered the Hallmark Valentines Day Package! I entered the Pillsbury Egg Scrambles and Grands! Biscuit giveaway.